We have been busy around here the last couple days so we haven’t had a chance to post about Priyanka & Nick’s reception. Oh how happy they looked! Held at the Taj Palace in the the bustling city of Delhi, the newlyweds celebrated with yet another lavish affair in style. The happy couple were all smiles at the reception full of high profile guests, including Indian Prime Minister Narendra Modi. The happy couple were just glowing as newlyweds. Priyanka made heads turn in a silver and cream lehenga, stacked red-and-white bangles and a draped dupatta (shawl) to match. Her hair was adorned with white flowers and she wore the most beautiful pieces of jewelry – a pair of glittering earrings and a triple-tiered necklace. Her dapper husband looked handsome as ever in a navy-blue velvet tuxedo. How happy do they look!!!?!?!? Indian weddings are full of colour, florals (lots of florals), elaborate backdrops and classic beauty. They in essence tell a story about the couple. 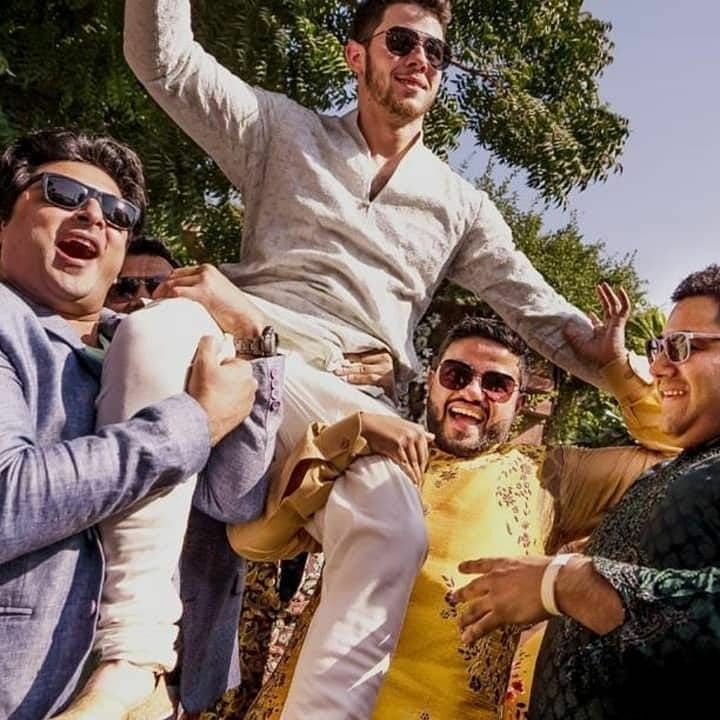 I’m sure Priyanka & Nick had a major hand in planning many of the details that we saw throughout their wedding celebrations. They even had a monogram initials created for their wedding events starting with the roka ceremony. As we’ve said before.. it’s all in the details! Can I just say again how absolutely stunning and elegant Priyanka looks! She is a classic beauty. One more thing..… the way he looks at her! 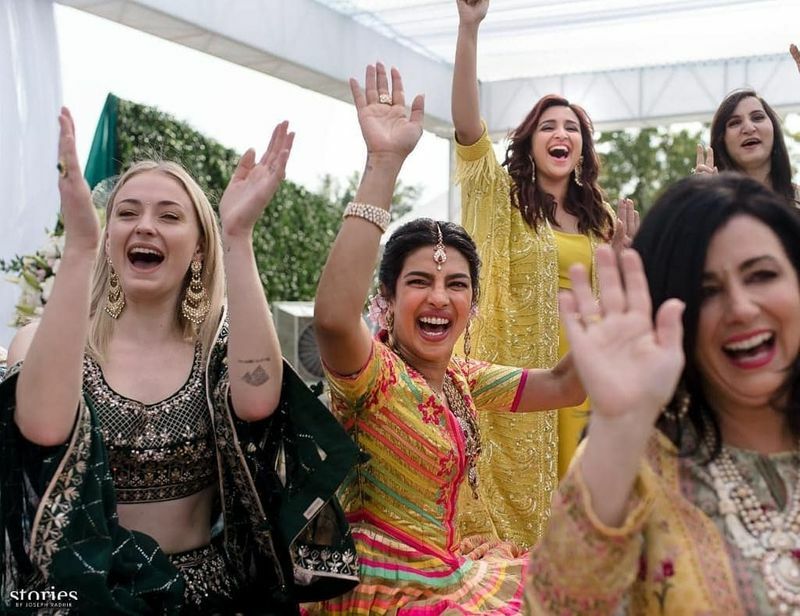 We just absolutely LOVE Bollywood weddings! From fresh, fun and colourful to elegant classic beauty, Priyanka Chopra + Nick Jonas’ wedding celebrations were nothing short of spectacular. A combination of two cultures made this fete one that was meaningful to both bride and groom. Should it be any other way?? Since cultural weddings like this one are multi-day celebrations, we wanted to share the beauty in each one! The first event is called a Mehendi. This ceremony usually takes place a day or two before the wedding where all of the women in the bride and groom’s families, along with close friends, gather together while the bride has elaborate henna designs applied to her hands and feet. Guests will usually get a few designs on their hands as well. Beautiful intricate designs created by very talented artists. Typically an ladies affair, the trend has gone towards having a coed event with both the bride and groom’s family and friends. The more the merrier I say!! An immensely colourful event with lots of singing and dancing typically kicks off the wedding celebrations! Wearing Abu Jani Sandeep Khosla, Priyanka and Nick looked like rockstars! They both were so happy they couldn’t stop smiling! Personally we are so in LOVE with her dress!!! Absolutely stunning and so much fun!!! I never thought that I would indulge in the phenomenon of Twilight... but I recently finished all four books ..... in one week! I absolutely loved them!!!! Being the romantic that I am... I was immersed in this series so much that I would be up at a very early hour.... just to read some more!!! I did watch the most recent movie - Breaking Dawn Part 1 in theatres and I have to say out of the four movies, it was the best one. Of course I was interested in the much anticipated wedding of Edward Cullen & Bella Swan! The setting was so soft and romantic! Check out these gorgeous images below and be inspired! Now for the most anticipated part of this phenomenon.... The WEDDING DRESS!!!! Designer Carolina Herrera had the honour of creating the perfect one for Bella's character. Check out the details ... from start to finish!! Beautiful vintage-esque crepe satin gown! How romantic a setting is this??? Bella and Edward wed under 160,000 wisteria blossoms. The custom-made designer wedding dress is valued at $35,000. It took six months, four seamstresses, and one high-fashion designer (Carolina Herrera) to craft the hand-made dress. 152 buttons flanked by French Chantilly lace lined the back of Bella’s gown. 17 buttons and Chantilly lace adorn each sleeve. 4 months, 12 sketches, and 3 prototypes later, the shoes were created. The destination is only accesible by boat or helicopter. Hope you enjoyed and were "inspired"! Official Royal Wedding Programme ! Along with a newly released photo of Prince William and Kate Middleton, the Official Royal Wedding Programme has been made available! For those of you that are lucky enough to be in London as we speak, the programme will be sold along the processional route for 2 pounds each. Wow! For those of you that are watching from the comfort of home, the programme is available online. Check out the following link! We are just hours away from the Wedding of the Century! I will be up early tomorrow! Everything is about the Royal Wedding!!! I love it! William & Kate have captured the hearts and attention of so many people and they will all be watching come Friday as they begin their journey together. Second in line to the throne - Prince William has grown up in the public eye and now will be moving on to the next stage of his life in the same fashion. Which wedding designer Kate chose to create her gown will be a focal point for many women! Including me! The "Princess -to-be's" fashion sense has created a following of sorts... for example her blue Issa dress in which she announced her engagement to Prince William, sold out within hours of the images being released! Wow! I know where I will be come Friday morning - do you? If you are still looking for someplace to enjoy the wedding of the century, check out the following for some options! Here is how the day will unfold on the small screen! • CTV’s William and Kate: The Royal Wedding starts at 3 a.m., with hosts Lloyd Robertson and, from Buckingham Palace, Lisa LaFlamme, alongside royal biographer Christopher Warwick, royal expert Victoria Arbiter and comedian Tracey Ullman (simulcast on CP24, CTV News Network and at www.TheRoyals.ca). • Global’s Wills & Kate: The Royal Wedding starts at 4 a.m. with Global National’s Dawna Friesen and ET Canada’s Cheryl Hickey. • Heather Hiscock kicks things off at 2 a.m. on CBC and CBC News Network. Peter Mansbridge will join two hours before the 6 a.m. wedding ceremony. • BBC Canada and E! have live coverage as well, both beginning at 4 a.m.
• E! dissects the day (and maybe some ill-advised hat choices?) in Will and Kate: Road to the Altar (9 p.m.) and Fashion Police: Royal Wedding (10 p.m.). • For anyone who didn’t get up before the crack of dawn to watch Kate walk down the aisle, BBC Canada is re-airing the big event, starting at 10 a.m. William and Kate: The Movie and A Tale of Two Princesses follow (4 p.m. and 6 p.m.).